3-Step Sparring (Sambo Dare Ee On). 1-Step Sparring (Ilbo Dare Ee On). Breaking (Kyuk Pha): 1" with any kick or hand technique. 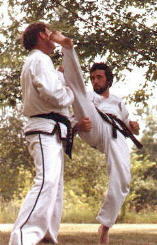 History (Yok Sa): Tae Kwon Do and ITA. Breaking (Kyuk Pha) : 1" with kick and 1" with knife-hand. Breaking (Kyuk Pha): 2" with hand and 1" with kick. Free Sparring (Cha U Dare Ee On). Breaking (Kyuk Pha): 2" with side kick and 2" with hand. Breaking (Kyuk Pha): 2" with hand and 1" jump front kick. 2-Step Sparring (Eebo Dare Ee On). Breaking (Kyuk Pha): 2" punch and 1" turning kick. Self-Defense Against Multiple Unarmed Opponents. Breaking (Kyuk Pha): 2" with hand and 2" turning kick. Breaking (Kyuk Pha): 3" with any kick. Breaking (Kyuk Pha): 3" with any kick, 3" with any hand. History (Yok Sa): Tae Kwon Do, ITA, Other Martial Arts.